Finally the default Unity Desktop’s left launcher panel can be moved to the bottom of screen in Ubuntu 16.04 LTS Xenial Xerus. Ubuntu 16.04 has reached its final beta today. One of the great new features is that the left launcher panel now is movable: to Left or to Bottom. 1. Launch Gnome Software from Launcher, search for and install dconf editor. 2. 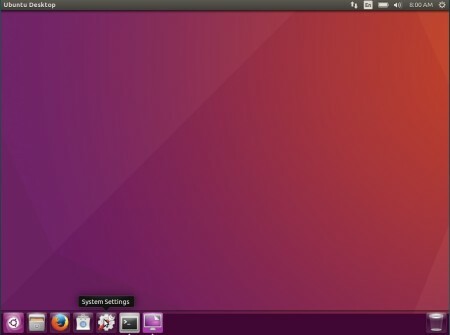 Launch dconf editor after installation, and navigate to “com -> canonical -> unity -> launcher”. Finally change the value of “launcher-position” to select Unity Launcher position. 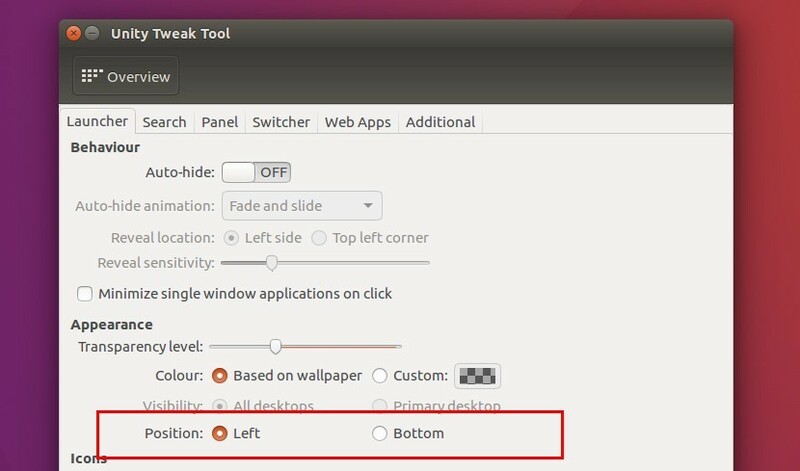 To make the bottom panel fit your screen, go to System Settings -> Appearance and change the value of Launcher icon size. You can move it, but auto hide is broken. The hot corners still only work if the launcher is on the left side. It’s still cool but needs some tlc. It belongs at the side.. That’s the whole point, it gives you more vertical space and makes use of wide displays which most of us have these days..
Me, I absolutely love it at the side and couldn’t imagine using any computer where it wasn’t. Is the left hand side a good option on a vertical display? Shouldn’t I be able and move the panel where I want it to be? Isn’t that the whole point? Steve you are right. But … with two much icons I prefer at the Bottom. Seems to me the “majority of the world” is now using full HD screens and resolutions, or will be a few months from now. Also reducing the launcher icons size to 32 allows you to get back some of that lost space. And FYI vertical eye movement on an horizontal panel is a lot less stressful for your eyes and brain than having to glance at the upper-left part of your screen every time you need to check what’s running, launch an app, etc. Upper-left task display is a very nice thing on vertical screens but clearly a setback on traditional desktop computers screens. So let me be glad that Canonical does *finally* allow me to make a choice. Thank you. I usually make the icons really small, so the loss in screen real estate isn’t such an issue to me. 23%??? Are you serious? My screen is 1600 X 900 and the launcher is FAR less than 23% of the screen, more like about 6% and I have it set to auto hide anyway. I like it at the bottom, it’s a more natural view. I started out using Tru64 Unix on Alpha machines. One of the CDE [Common Desktop Environment] features was the ability to add a “custom” label to the icon bar – then add shortcuts to that. On the standard Launcher, this would be like a sub-menu of icons popping out to the right. I really miss those sub-menus: they help reduce menu clutter, and can group similar applications. The OSX menu bar doesn’t have this, either. [Sigh] sometime I miss Tru64 Unix. worked great, I like the taskbar on the bottom, easier to move cursor there than all the way to the left for every damn thing. Thanks!!! Thanks for the launcher command line info. My next question is using the gsettings how to make the icons smaller. I use to use the dconf to do this but how to gsettings? It is possible to move launcher to right side? :(, only left or bottom. if you scroll down further down from the display bottom, menu will appear. 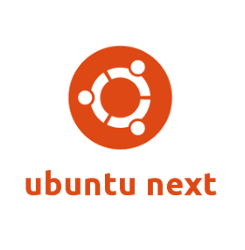 Is it possible to move in ubundu 14.04 ?